FoodSafe fridge thermometer. A traditional fridge thermometer only measures the air temperature. This is a major problem because cold air is heavier than warm air and therefore "drops out of the fridge" the moment the door is opened. The FoodSafe food simulant fridge thermometer, on the other hand, is an encased fridge thermometer that ensures that it indicates temperature similar to that of the food stored in the fridge or chill cabinet. Therefore it is not subject to the changes in air temperature that normally occur when the door is opened. It is the temperature of the food that is important in preventing the growth of food poisoning bacteria. The easy to read FoodSafe is ideal for domestic or commercial use, as it is reliable, robust and hygienic. The thermometer indicates temperature over the range of -25 to 40°C with an accuracy of ±1°C over the range of -5 to 20°C, 2°C thereafter. The thermometer is housed in a clear plastic case with colour-coded zones that indicate when the temperature is too warm. 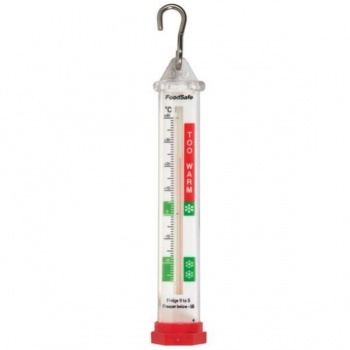 Each FoodSafe thermometer measures Ø25 x 150 mm high and is supplied with a metal hook for hanging in a fridge. FoodSafe fridge thermometer simulates food temperature rather than fridge temperature. We purchased three of these for our Coffee shop. Worth investing in a better quality unit. Robust and clear to read temperature guage. Good service, great product. Intend to use again.